A twist on the classic potato latke recipe, these deliciously crisp latkes are made with a combination of sweet potatoes and Yukon Gold potatoes. You'll find that you can't go wrong with these salmon-topped crisp potatoes. Microwave potatoes and onions in large microwaveable bowl on HIGH 4 to 5 min. or until potatoes are softened; cool slightly. Combine flour and baking powder. Add to potatoes along with the onions, eggs and dressing; mix well. Heat oil in large nonstick skillet on medium-high heat. Working in batches, spoon about 1 Tbsp. potato mixture into skillet; flatten with back of spatula. Cook on medium heat 1-1/2 to 2 min. on each side or until golden brown. Drain on paper towels. 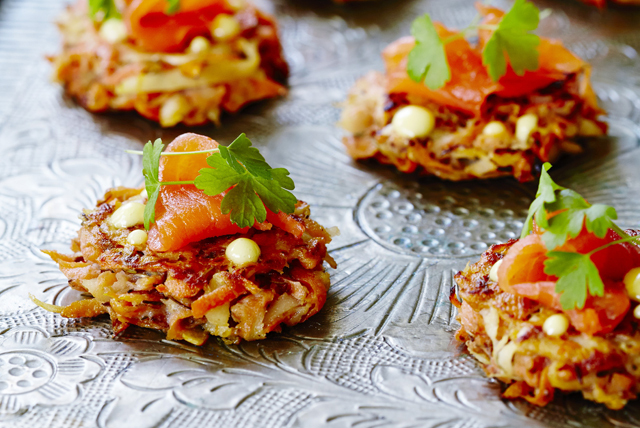 Serve latkes topped with salmon.